In commemoration of the 800th anniversary of Magna Carta in 2015, Hereford Cathedral celebrates the sealing of this historic document through a year of exciting exhibitions, colourful banners, pop up displays, ‘hands on’ interactives and displays of original documents and artefacts, featuring the Cathedral’s own 1217 Magna Carta. The exhibitions tell the story of Magna Carta, its legacy, and the part Hereford and the people of the Marches played in its making, looking at life in the 13th century and charting the turbulent conflict between the Plantagenet kings and their subjects. Illuminated manuscripts from the Cathedral’s chained library illustrate the law and justice of the time, and are displayed alongside other documents from the reign of King John and his son, Henry III. Find out how the Hereford bishops, Giles de Briouze and Thomas Cantilupe (St Thomas of Hereford), played a crucial role in the story as well as William Marshal and Pope Innocent III. 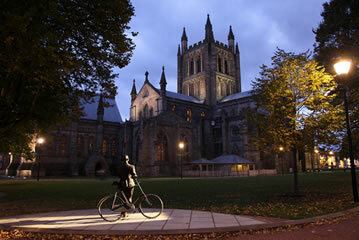 Hereford Cathedral celebrates this significant event with exhibitions, lectures, special services and evensong. There will also be a Magna Carta themed re-enactment day at the cathedral, and Magna Carta will be celebrated at the 300th anniversary of the Three Choirs Festival in July. From Easter Hereford Cathedral welcomes a rolling programme of coach tour operators with booked groups taking part in the National Magna Carta Tourism Trail. Hereford Cathedral is normally open to visitors between 9.15 am and Evensong, to which visitors are warmly invited. However times may vary for services and special events, so it is advisable to check the cathedral website at www.herefordcathedral.org, before visiting. 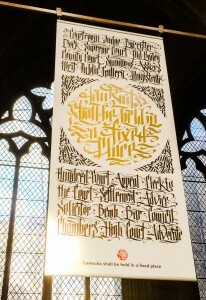 Evocative calligraphic banners in the Nave of Hereford Cathedral will celebrate justice, liberties and rights in an artistic installation. This banner (featured, left) is one of the banners standing in the right-hand side of Hereford Cathedral. 23 March – 30 September 2015. Two important Magna Carta items are housed in the New Library building of Hereford Cathedral together with a wealth of other fantastic treasures. The Hereford Magna Carta, the finest surviving 1217 charter, represents the most significant revision of the original 1215 document issued by King John’s son Henry III. The Library also holds the sole surviving copy of ‘King John’s Writ,’ a letter issued to royal officials across England, from his meeting with the barons at Runnymede. The Writ, essentially the Magna Carta ‘covering letter’, instructs recipients to ensure the terms of the charter are made known publicly, sworn to and kept. It will be displayed as part of the British Library’s major national exhibition, ‘Law, Liberty, Legacy’ for much of 2015. Hereford Cathedral’s own exhibition will display the Hereford 1217 Magna Carta alongside period illuminations and other documents from the cathedral’s archives and historic Chained Library. A series of pop-up displays located around the cathedral, exploring Hereford’s connections with the Magna Carta story, and life in the 13th century. The exhibition is ideal for families and schools, featuring ‘hands-on’ interactives and costumes. The dedicated Magna Carta Exhibition (Magna Carta: Icon of Justice – Pledge of Freedom) will be opened to school parties on Tuesday mornings between 9.30 and 11.30. Booking is essential. Pupils will look for ‘King John’ amongst the displays, and work sheets and will guide them through the exhibition. Magna Carta ‘surgeries’ will take place in the Cathedral Barn, followed by a visit to the main exhibition, Magna Carta: Icon of Justice – Pledge of Freedom. These will begin with a short lecture and will allow plenty of time for questions and discussion. College Hall at Hereford Cathedral, 7pm. A lecture by Nigel Saul, Professor of Medieval History, Royal Holloway University of London. A wide-ranging and relevant talk by an authority on English late medieval history exploring the anomaly of our non-constitution. In all his teaching and writing he lays strong emphasis on generating interest in the past and making scholarly research accessible to non-experts. In this lecture Nicholas Vincent, an authority on Magna Carta, will explain the background to Hereford’s role in the Magna Carta. He will talk about civil war and the coming of peace to Herefordshire in 1217. This lecture is co-sponsored by the High Sheriff of Herefordshire, Mr Edward Harley. The Lord Lisvane KCB to preach. This year’s 300th anniversary Three Choirs Festival will include talks and community events reflecting the themes of Magna Carta. A ‘Hands on History’ re-enactment day for families. This event, featuring colourful costumed medieval characters, will include medieval music and activities for all the family, with hats and cloaks to try on, and brass rubbing in the cathedral.